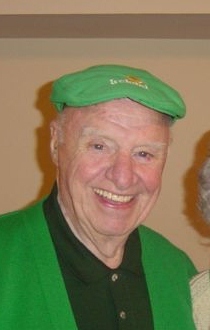 Charter member of St. Patrick Division 1 Somerset County NJ, Bernard J. Sloan, — “Barney” to his countless friends — died on September 15 at his home in Somerville, NJ after a valiant fight against cancer. A Mass of Christian Burial, presided over by AOH member Monsignor Seamus Brennan was celebrated at the Immaculate Conception Church, Somerville. The large attendance included a guard of honour of fellow members from the Division. Barney was born in Brooklyn, N.Y., and was so very proud of that. He later became a resident of Somerville, N.J., for 50 years. He was the manager of Port Newark Marine Terminals for the Port Authority of NY/NJ, retiring after a 40-year career. A Navy veteran of World War II, he served in the Philippines during their liberation. He received his BS and MBA from New York University. His beloved wife, LAOH sister Helen (Callaghan) Sloan, predeceased him in 2008. Barney was an Irish Catholic through and through and a steadfast parishioner of the Immaculate Conception Church in Somerville. He was a charter member of the Ancient Order of Hibernians in Somville, where he once served as the grand marshal for the AOH parade. Largely due to his untiring efforts, the work of hundreds of unnamed Irishmen in building the Delaware and Raritan canal was properly recognized by the Delaware and Raritan Canal Commission and a memorial gravestone was erected at Griggstown Cemetery. He was also a life member of the Somerville Elks and the Knights of Columbus and devoted many hours to various charitable organizations and community events. Barney had many, many friends and was well-known for his wit and generosity. Memorial donations may be made in his memory to Immaculata High School Foundation, 240 Mountain Ave., Somerville, N.J. 08876, or Jack’s Kids, c/o the Somerville Elks Lodge 1068, 375 Union Ave., Bridgewater, N.J. 08807.